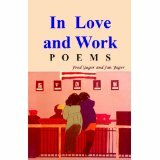 In Love and Work begins with “A Note from Jan” about the evolution of this collection of 87 poems by a husband and wife, writing separately although several of the poems are about each other. It covers all types of love, from romantic love to the love of a parent, sibling, child, grandchild, pet, and friend, to work, whether that work is serving in the Navy, witnessing the 9/11 terrorist attacks on the way to work, writing, being an artist, and more. There are poems in celebration of birthdays, Valentine’s Day, and wedding anniversaries. The styles of the poems range from free verse to rhyming, from solemn (“The Victim”) to more whimsical (“Children’s Day”). The anthology includes an essay by Jan Yager about the evolution of the collection as well as Fred Yager’s essay reflecting on the ten year anniversary of the September 11th attacks. Fred Yager is a communications executive and the author of nine books including five novels. Jan Yager is a sociologist whose 35 nonfiction and fiction titles have been translated into more than 30 languages. The Yagers are a husband and wife writing team whose collective output includes two career books, two thrillers, two collections of poetry, and numerous screenplays.